Works with version CSM 4.2.4 Made for Windows 10. Can work somewhat same on Windows 7, using Win 7 settings below. Then go to "Start Menu Style" tab. Pick "Windows 7 style". Pick "Two Tone" in Skin tab. In my opinion, Windows 7 has a better blur. Just enough to blur text, and is powerfully transparent. Open the "Menu Look" tab. Crank up the "Menu glass intensity" to 100. Set the "menu blending color" to 25. A different kind of beast. can't have full glass on the left side, only partial, when using Windows 7 style. So it's a bit difficult to keep the left and right columns in balance. and the left column with mild light, or mild dark color. Just cannibalized parts from Metro, America RWB, and Two tone classic. If you don't want transparency, or blur, go into menu look tab. Make sure "Enable menu glass" is checked, then set "Glass opacity" to 100.
or use Windows Personalization Color settings to set the type of color/grey you want. Well that's about a good as I can make it, with my limited abilities. Feel free to change the skin for the better, or use parts for your own menu skin. This has been quite the adventure, thanks to the mask man, (Ivo). (the text, or bitmap pictures, that instruct where to apply steady, or changing color). Difficult to keep up with it all. I see even text, can now have a mask applied to it! I have only tried a few of the masking techniques, in skins that I have made, or modified. Never even tried the (start screen colors, or tint colors). As it's a bit of a guessing game, as to what Win 8/10 colors will look like, even though Ivo has provided a great Color palette utility. Some change tint, others stay the same. Last edited by juniper7 on Sun Nov 01, 2015 12:20 pm, edited 1 time in total. 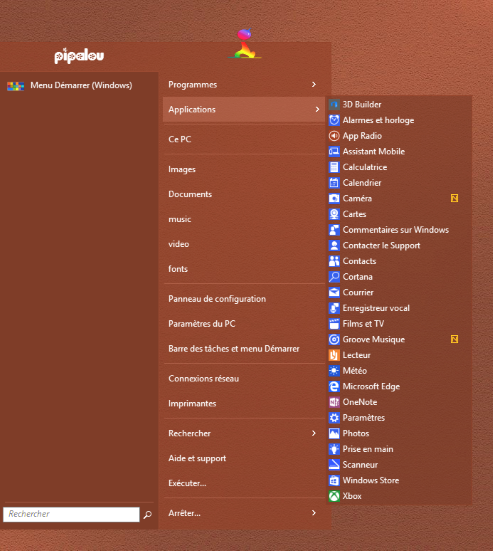 Big theme for w7 but for my part I use the classic version "two tone for Windows 10" and I am very jealous of the menu " to user_image " which you propose in your version w7. Would be it possible to propose it with the classic version? I always look forward to your themes and I am never disappointed! About the user picture types, asking to be put in the classic Two Tone. I promised to help other people in other of life's duties in the next while. It will have to wait. Sorry. Can I persuade you to use Win 7 style? You can adjust in CSM settings, to have fly out programs submenu. I have copied over your avatar, and made as a borderless picture. Your very own personalized 7 style menu. Viva la Pipalou50! Maybe it could start a new trendy feature? It would need to be easy to add, and to auto fuzzy the edges. and make your own avatar to fit the same proportion sizes. Have fun. Got to go. EDIT: I did it the hard way! Ivo has easier way for transparent png icon/pictures, on some skins. Last edited by juniper7 on Wed Oct 28, 2015 11:41 am, edited 1 time in total. Thank you, juniper 7 Nice job! I didn't forget about you, Pipalou50. The agony of brain pain menu logic, has got the best of me. Hoping to finish by end of weekend, or the next weekend after. Need lots of time, with so many options. It can't have outside picture in Classic style glass blur. Gets some nasty artifacts. See picture. That's what it looks like in Classic style, with glass text in skin, with glass feature turned on and off in CSM. Even Asian devil put on a sour puss. I commend Ivo for having an opacity setting in CSM, that reduces the residual glass color. But in this case, will have to be alpha for that option. that can make it work better, without a separate user image window? it can be done, with some of the newer metro skins, including this one. It was there all the time. using the "user picture" override setting in "General Behavior" tab. I have to stay focused on one skin at a time. I skipped working on the original Two Tone (Classic style). Instead, did a slightly faster way, by renaming the file Two Tone "skin.7" to "skin". Then just fixed a number of things to make it work in classic style. Until I realized I forgot all the one column Classic info needed too. Took a long time. I think most of the bugs have been squished. can't make the frame white. So, chop-chop. is a separate window and will have nice smooth corners. just have to turn off the menu shadow in csm settings. But if skin instructs CSM to use glass, artifacts (dark edge pixels, residual glass color breakthrough), appear around the user picture. See the picture from earlier post. As well as top menu flashing, when animated menu opened. So I turned off glass, when the picture 1/2 outside, switches to alpha mode. More chop chop! as well as separator lines put back in. As one of my past work bosses said, "Nothing sits, everything changes". Ooh yeah, If you want to have a transparent surrounding user picture, Ivo mentioned a simple way, as what is in his "Metro" skin. one can override that picture with one of your own transparent background 32 bit.bmp, .png image. Go to "General Behavior" User Picture. It works best picking the square option in the skin, as it's picture won't get cut off at the corners. I am sorry, I made so many words to translate back into French. Hope you understand some of it. Thank you juniper, it is very kind to have taken time to make him : that was worth waiting! + for the .png image returns the quite magnificent. ps : And I believe that I understood everything! How did you get that logo when the username is supposed to be there? Is it a command? I don't think they had image emblem feature back then. Pipalou50 would have changed the font for the user name. That's done by opening up the skin file with Resource Hacker. User_font="Segoe UI",normal,22 to whatever font you have in your system. The type of font, and size can put the name placement out of bounds, (get cut off, or sit on top of user picture). Use this help font topic for more info. Some newer menus allow a user picture area to become invisible using transparent png image. Picture is inputted under the General Behavior tab. Look for User picture text.